32 anglers fished the latest Sunday open on the Specimen Lake and what a day fishing everyone enjoyed. Winner on the day was Neil colcombe (Larford) who drew peg 8 on the burr weighing 231-00-00. 2nd on the day was Chris Bradrey (Dynamite Baits) who drew peg 16 on the burr weighing 229-06-00 to bomb & pellet and paste short. Chris was knocked back by 30lbs so could have won the match overall. 3rd placed Mark Hawthorne (Bait Tec) drew peg 4 weighing 192-11-00. Mark caught on bomb & pellet and down his edge fishing corn & meat- he also weighed a number of 20lbs fish. 4th on the day was fishery owner Phil Briscoe (Colmic) who fished bomb & pellet and paste short on peg 14 weighing 192-00-00. Phil was also knocked back. 5th placed Brian Jones drew peg 6 weighing 158-03-00 to bomb & pellet and meat short. 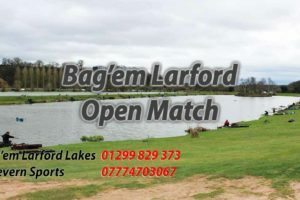 6th on the day was Phil Bishop (Larford) who drew peg 12 weighing 129-06-00. Phil caught all of his fish short on meat.